So, I had to return this really fun cabana printed maxi skirt to LOFT yesterday. I really wanted to love it - and my good friend, Andrea looked so cute wearing it - but it was just not happening for me. When I was in the store, I spotted this jacket - so I decided to try it on and snap a picture. Okay, can I just say that taking dressing room selfies is not easy - where do you look, how do you hold the phone without making your hand look awkward - and cover up what you are trying to show. (And, my hands kind of looks hugely awkward - and they are not that big.) Two hundred photos later - I'm not kidding - here is what I got. 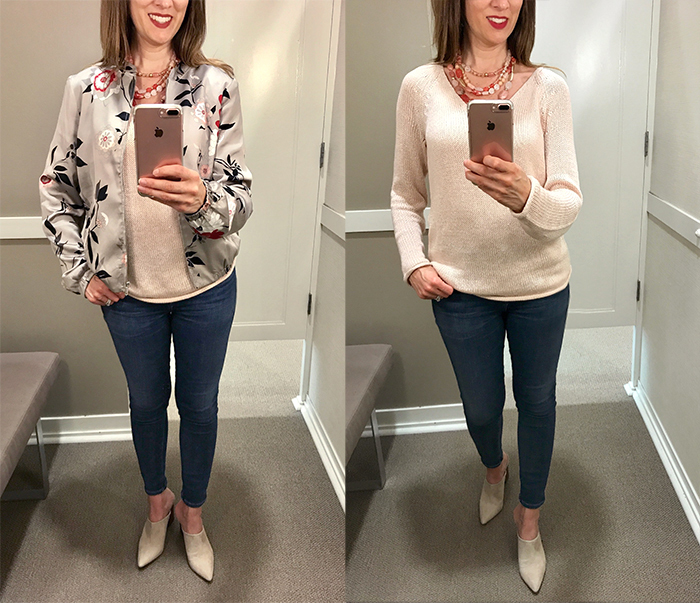 I wanted to share this really cute floral bomber jacket (I did not buy - but will when it goes on sale) and this chunky necklace that I bought - and is on sale. Also, this sweater that I am wearing is only $18 and these really cute pointed mules are on sale and really comfy. While I was in the store, I also looked at this floral skirt - which I really liked, too. I cannot believe these velvet flats are only $18. This striped boyfriend shirt is only $15. Can I just say - I see a lot of these tops - but I really do not understand the placement of the embroidery. This palm print cami is only $18. This on trend straw tote is only $10 and comes in two colors. This pretty jacquard off white dress (also comes in black) is only $25. This kimono cardigan comes in four colors and is under $25. This blouse is marked down 50% and comes in poppy red and blush. Does anyone else think this lipstick smells like cookies (or cake)? This ring looks like David Yurman but costs hundreds less. Nine West had a flash sale yesterday - so I picked up these floral print pumps for a great deal. Nine West is pretty much the only brand of pumps that fit my feet and that I find to be comfortable. I wear them out quickly because I wear them so much - so I try to stock up when they are on sale. I have been avoiding the loft because I know that I will spend too much! so many cute things and the sales for summer are crazy! They do have so many great sales! Girl, I'm with you on the embroidery placement. Maybe it's my age, but no way could I walk around like that. It's super cute in person. But you definitely nailed the dressing room look! Great outfit! I really need to shop in the store more often. I loved that skirt on Andrea! I have a hard time with changing room selfies, too and I always feel like they're going to think I am in there too long! I swear I can spend an hour in a changing room taking pics and trying stuff on and then again and again to make sure I want it. LOL. I love that floral jacket! I know I feel the same way about the amount of time - yesterday the sales associate was waiting for me - and I was so embarrassed. I just got the cutest shorts from Loft. They are killing it with their summer line! I give you half points for half showing me your hair. I can picture your gorgeous face smiling though! Also that bomber is totally you. Just add a tuque. In love with the floral bomber jacket!! So chic! So glad you waded through all 200 photos to find some to share with us. Had a giggle over your hand comment. Have you ever seen the Jerry Seinfeld episode about man hands? Your comment (but not your hands!!) reminded me of that. Love the bomber. I like the muted colors. Mine is very bright which I also like but this would be a nice alternative. I had seen the H&M embroidered top with the questionably placed embroidery. I like it but don't need any more attention called to my 'girls'. And really think the top would be so much more tasteful if the flowers were a bit higher, lower? Thank you for making your links open to another tab, it makes checking them out and going back to your blog easier. Love the straw bag. Wish it was available in tan. Might get the white anyway. Want to sew some pom-poms on it. Those changing room selfies are hard! You did great though! A flash sale at Nine West?! I missed it! I love Nine West shoes. They're my absolute favorite for affordable, professional, and comfortable shoes for work. I'm a big fan of this bomber, too! Super cute jacket! And selfies are always hard. You did a great job! I haven't been in Loft in ages. That bomber jacket is really pretty! I haven't been to Loft in so long, it's about time I get back there! Such cute stuff. Love this bomber, it looks like it would go with so much and the print is so soft and pretty!